Every city has its own iconic foods -- New York has the pastrami sandwich, San Francisco has its sourdough, and Dallas has deep-fried Kool Aid. 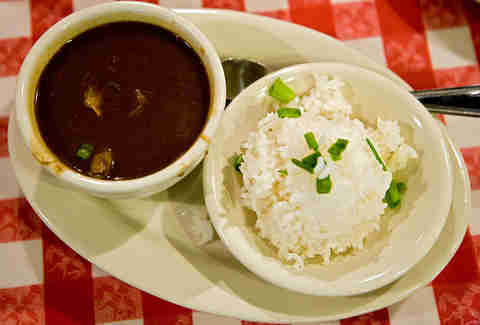 As for the Crescent City, they have so many signature plates of food, they're a veritable gumbo in their own right. There are, of course, oysters and the muffaletta, which we’ve discussed before, but here’s our list of the other most iconic dishes in the Big Easy and the best places to enjoy them. 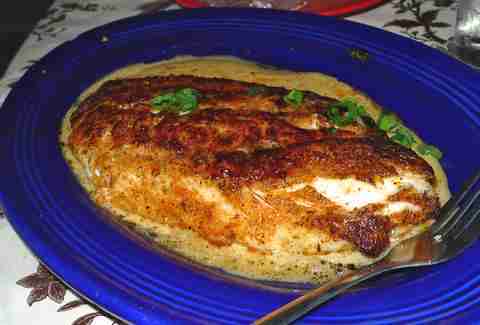 Paul Prudhomme invented this dish at K-Paul’s back in the ‘80s -- a highly seasoned, firm-fleshed Gulf fish seared hard in a cast iron pan like an Indian Steak -- and it was responsible for Cajun cuisine making it onto the national radar at the time. You can still get a solid version at K-Paul’s and many other local spots, but Jacques Leonardi’s version over at Jacques-Imo’s on Oak Street is the killer (plus? Alligator sausage cheesecake). 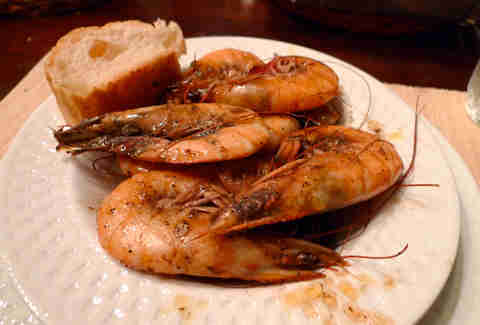 Okay, so the confusingly named “BBQ shrimp”, in the New Orleans fashion, has nothing to do with traditional BBQ. But it has everything to do with shrimp, particularly the kraken-sized monsters found in the Gulf of Mexico, poached in a ton of butter & black pepper. 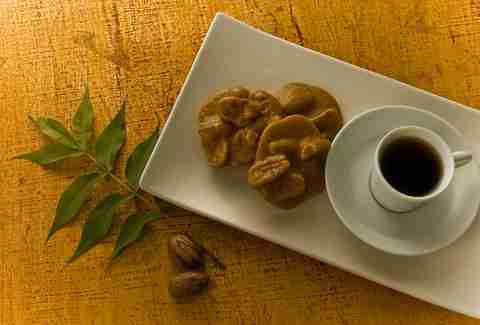 There are a number of places to find this favorite, but it’s the house specialty at “Manale’s”, and for good reason. While they might be best known for their po-boys -- especially the Ferdi Special (baked ham and roast beef drowning in “debris”) -- Mother’s also specializes in some other NOLA classics as well, including a spot-on jambalaya. Desserts in New Orleans don’t get any sweeter (both literally and figuratively) than the praline, which is of course, correctly pronounced “PRAH-leen”. The quintessential pecan praline is one of many varieties at the French Quarter’s Southern Candymakers, and they make both an excellent treat, as well as a nice gift to bring back from your stay in NOLA. You know, for you. Speaking of desserts, bread pudding happens to be a specialty in the Big Easy, owing to our abundance of uneaten French bread. 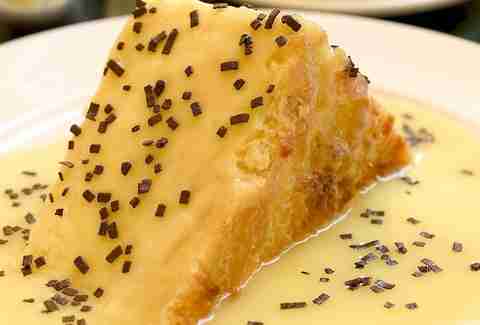 Seemingly every New Orleans restaurant has this one on their dessert menu, but the white chocolate-stuffed version at the Palace Cafe (topped with a gooey white chocolate ganache) is clearly the city’s winner. That’s right, we went there. While the crispy chix at Willie Mae’s Scotch House is generally regarded as the best in town (and well worth your attention), the dirty little secret held tight by many a New Orleanian is that the ultimate fried chicken experience in New Orleans is actually at Popeyes. It may be an international behemoth at this point -- there’s one in Kuala Lumpur -- but Popeyes was born in Louisiana, and their spicy chickies (and those biscuits, holy mother of…) were perfected here. 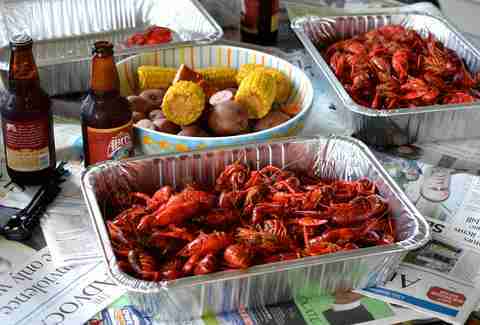 Credit: Yelp / Alain D.
You won’t find a decent version of this dish outside of the Gulf Coast (many imitators try to get by with frozen Chinese crawfish instead of fresh Louisiana mudbugs), and for the very best, you have to be in the Pelican State. 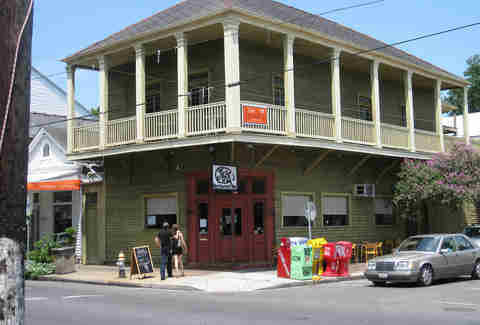 Bon Ton Cafe dishes up Cajun and Creole specialties with all the respect and reverence they deserve, especially the shrimp or crawfish etouffee. There are a number of restaurants in NOLA where you can find boiled crawfish by the pound, but they tend to be inconsistent and overpriced. 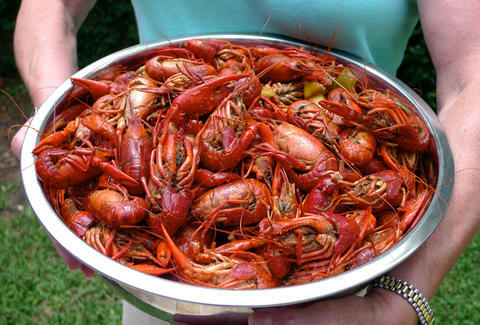 For the authentic experience, visit New Orleans during craw season -- late Spring and early Summer -- and find yourself a good, old-fashioned neighborhood crawfish “berl”. This used to be word-of-mouth only for locals, but in the new millennium, we’re lucky to have a crawfish finding app for our smartphone, which will conveniently lead us in the direction of those wonderfully spicy boiled critters (plus corn, potatoes, mushrooms, and sausage). So it’s technically not in New Orleans (or literally... whatever), but if you want the very best gumbo in the world, make the trip out to Prejean’s in Lafayette for their incomparable smoked duck & andouille version, made with a dangerously dark roux. If you’re not up for a ride into Cajun territory, Prejean’s always sells their pheasant, quail, and andouille gumbo at Jazz Fest. 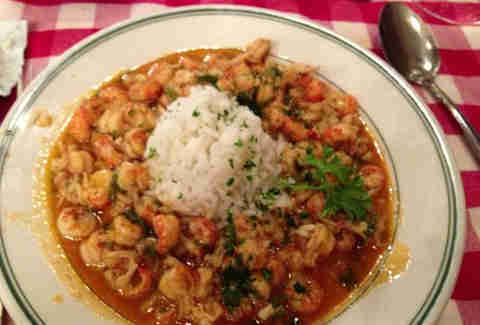 If you really want the most perfect version of this beloved NOLA specialty (strictly enjoyed only on Mondays), you have to have it in someone’s home, preferably simmered patiently all day under the expert supervision of their mother, grandmother, or similarly skilled male relative, because gender doesn't matter here. 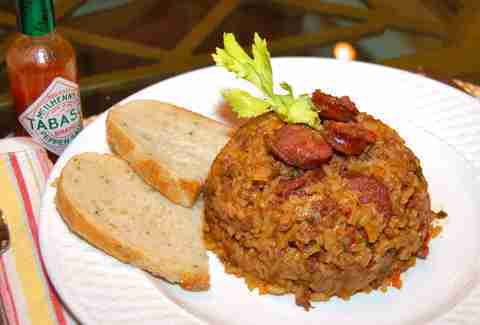 But if forced to find red beans in a restaurant, it’s difficult to do better than the version at Joey K’s Restaurant, which has the perfect creamy consistency and -- most importantly -- is loaded with pork.